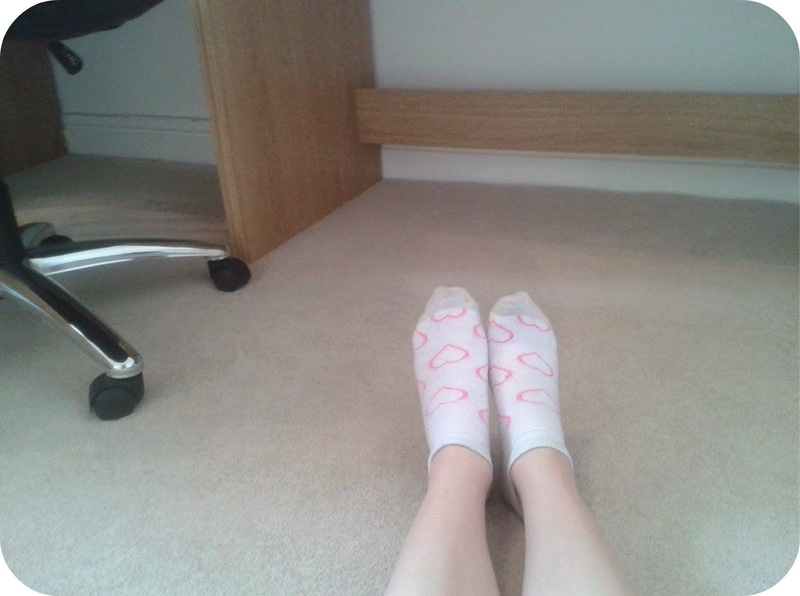 So this is the brand new carpet below my rather cute (albeit small) heart socks I was just telling you about. Last time we had a carpet fitted, we paid someone to do it. However, this time my dad managed to do it by himself and I'd say he did a very good job indeed! Brand new carpet is the best - ever so soft - my cat has already started lounging about on it a lot! So here is the portion on the far length, as well as the filing cabinet. 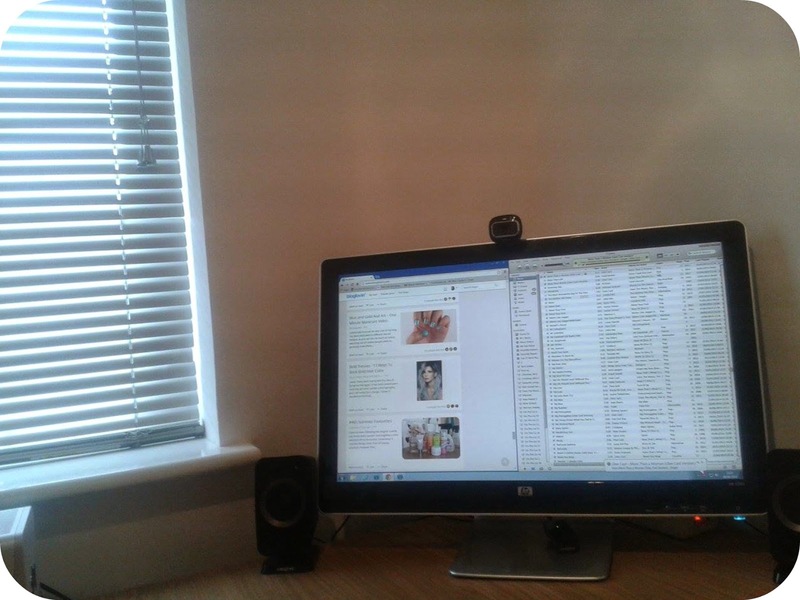 It's pretty great for storage - there is one main cupboard and two filing cabinet sections- the second of which has already been used to it's advantage as you can see! 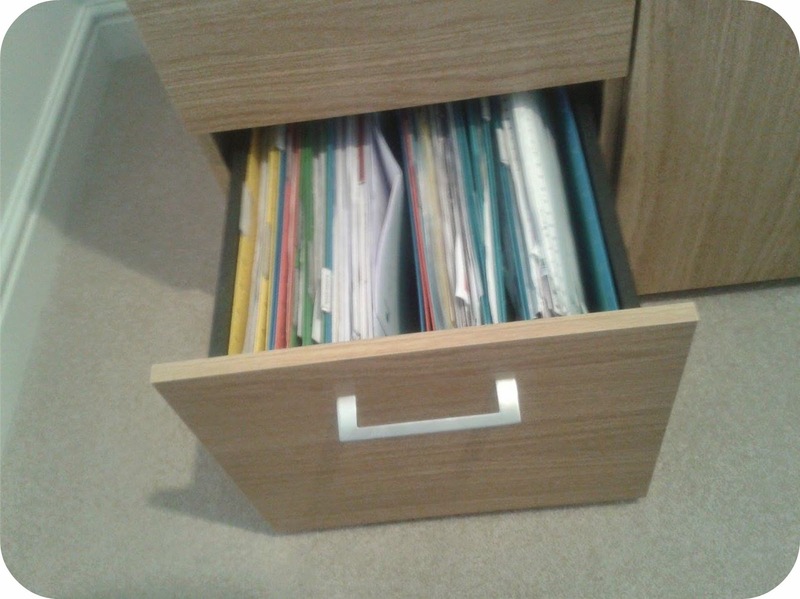 The filing cabinet is the 'Walton 2 Drawer Filing Cabinet - Oak Effect' which was £69.99 from Argos. Next to it is the 'Walton 2 Door Cupboard - Oak Effect' which was a tad pricier at £79.99 from Argos. 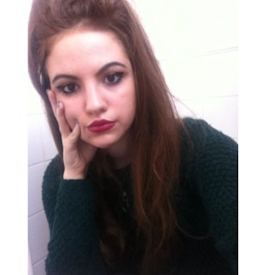 Oh so you want me to go into detail about the stuff on the desks as well? Alright you nosey lot (nah I'm only kidding, I just thought I might as well anyway!). But yeah anyway, as you can see we have silver blinds on the windowsill which makes for very annoying lighting in some of these photos! As you can see on top of the filing cabinet my parents had a bit of a haul in Staples yesterday (I definitely have my eye on some of their notebooks and Filofaxes!) but nothing really interesting was bought - just the office essentials of paper and ink cartridges! 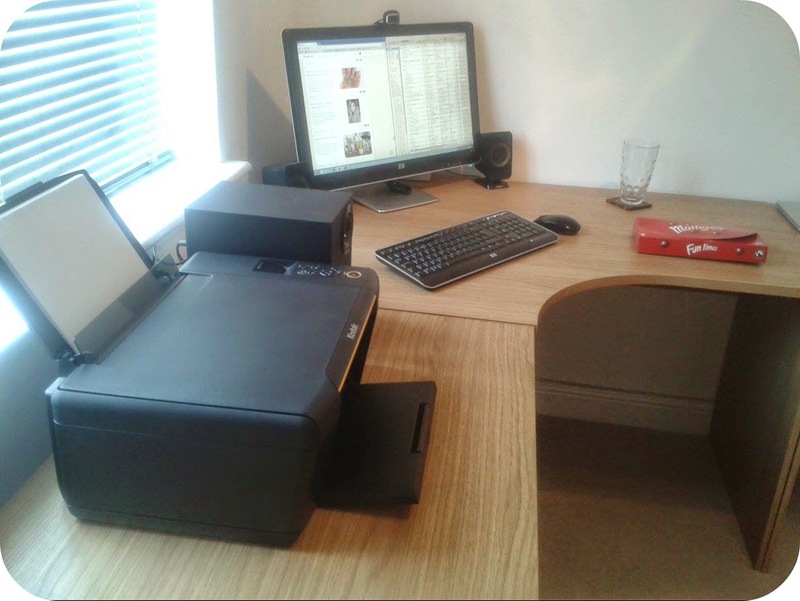 You can also see a Kodak printer (I doubt you can tell it's Kodak - cheers awkward blinds!) and right next to that is a Creative speaker to control the bass of songs that I play on the computer. So this is the next section! 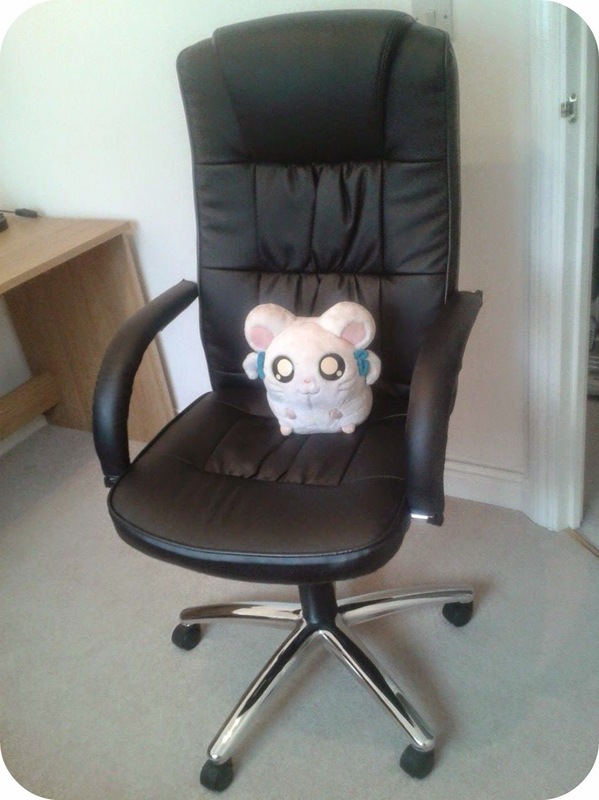 In the first picture is the amazing office chair we currently have. I'd recommend it as it's SO comfortable and currently on sale! It's the 'Scott Deluxe Feather Face Swivel Office Chair - Black' from Argos at the currently reduced price of £49.99 from £99.99! Oh and I decided that my Bijou cuddly toy would make a better model than myself! So anyway, the next portion of the office is a desk that connects to the Cupboard in a curved manner. This desk in question is - you guessed it! 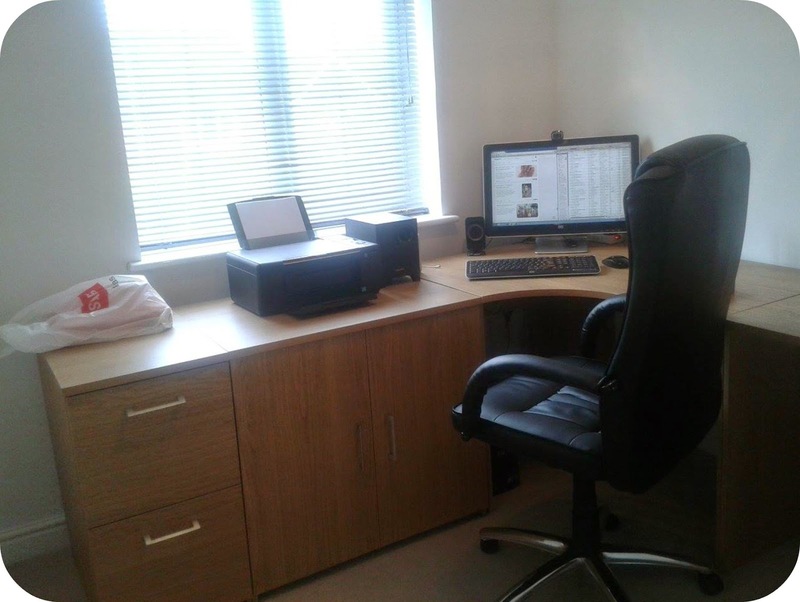 - also from Argos, it's the Walton Corner Office Desk - Oak Effect which is available for £69.99. 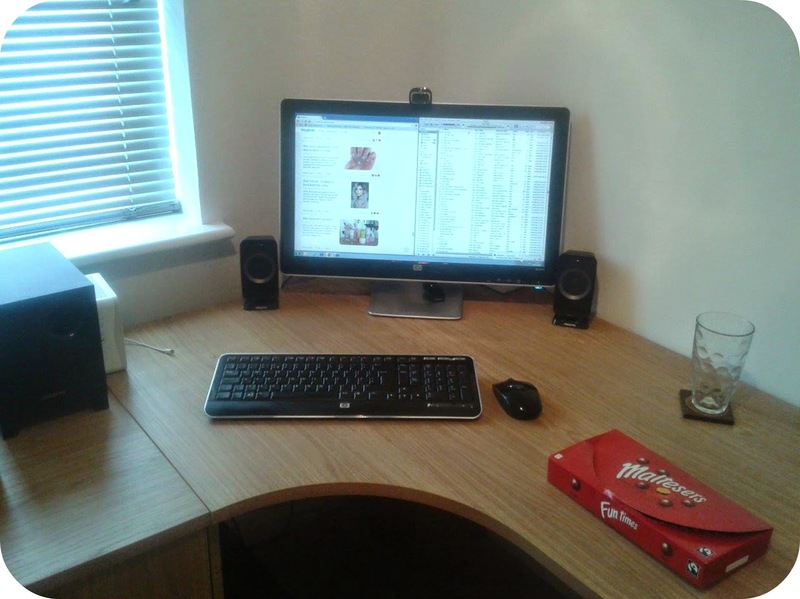 On top of this desk is the HP computer we've had for a good 4 years or so now, accompanied with speakers, mouse and keyboard. If you take a close look on my screen you can see I have iTunes and BlogLovin on there! (If you were wondering, the blogs that my BlogLoving was currently showing were http://cocktailsinteacups.com [#465 Summer Favourites post], http://toyastales.blogspot.co.uk [Bold Tresses - 13 Ways to Rock Bold Hair Color post] and http://letsstrikeapose.co.uk [Blue and Gold Nail Art - One Minute Manicure Video]). Anyway, there was also a coaster with an empty cup (interesting right!!) 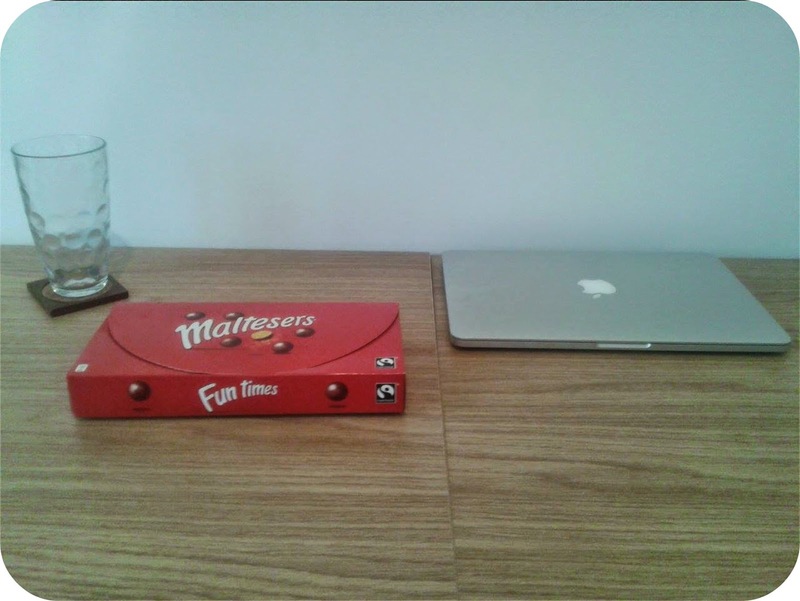 and the remainders of the Malteasers box that I received for my birthday - which have since been completely devoured since starting this blogpost - oops! 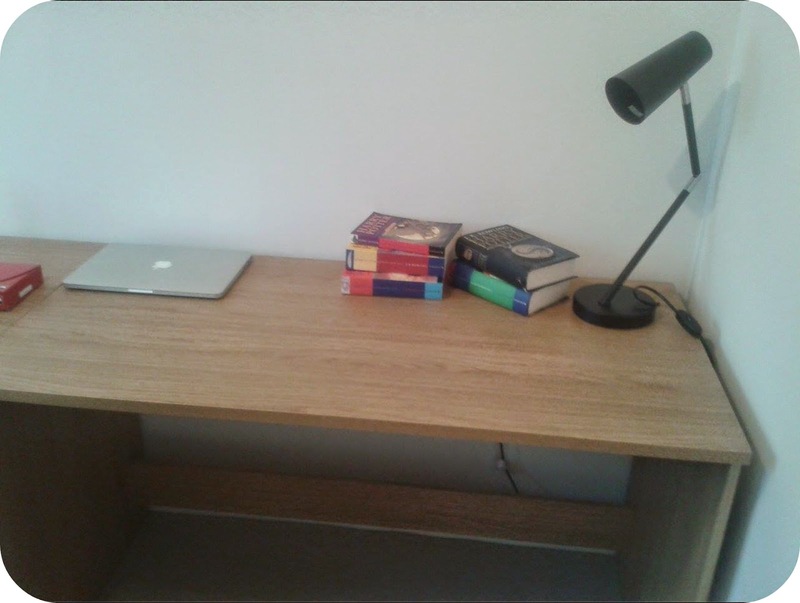 In the final picture you can see my Apple Macbook also, which will bring me onto the final desk now. 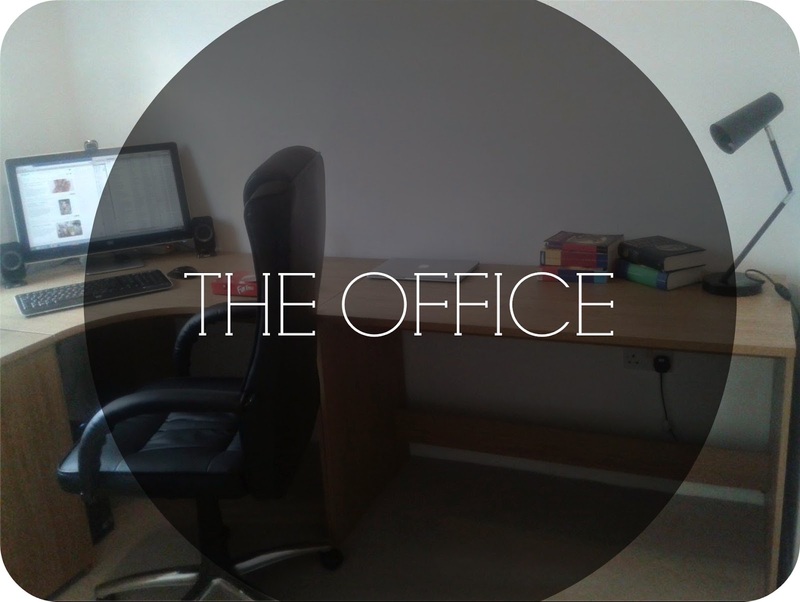 So here is the final part of the brand new office! 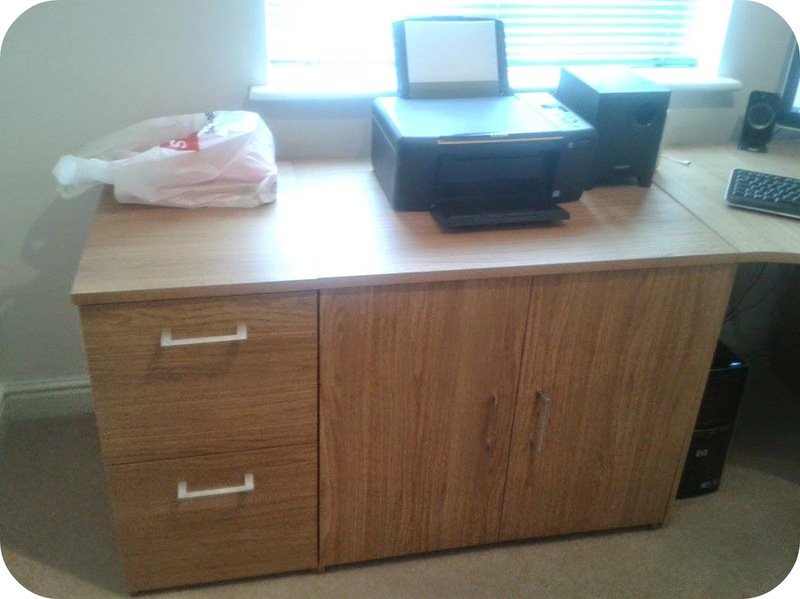 Another piece of furniture from Argos that holds more stuff on and connects to the corner desk - this one is the Walton Office Desk - Oak Effect for £59.99. This part of the office looks VERY show-home/tumblr haha but adds that little extra to spruce it up a bit! 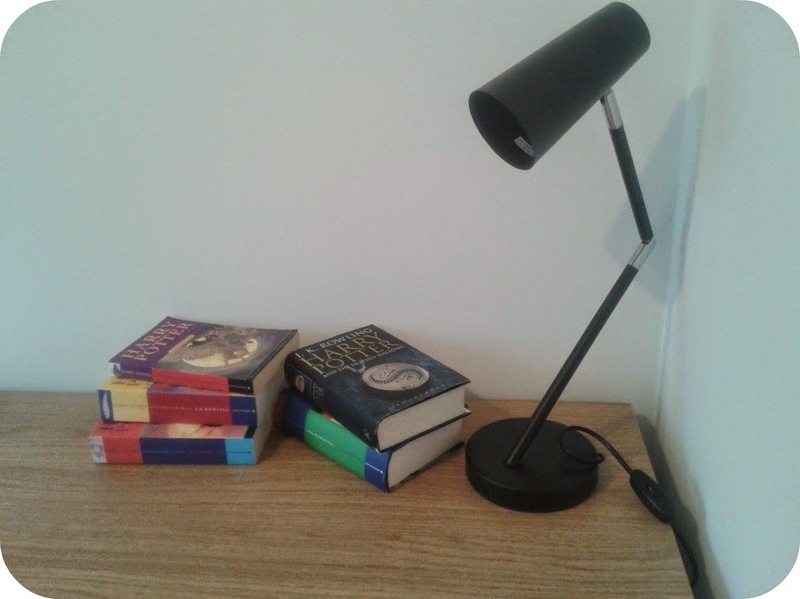 Aside from my aforementioned Mac, you can also see two stacks of Harry Potter books that we own (The Prisoner of Askaban, The Order of the Phoenix and The Goblet of Fire on the left pile, and The Deathly Hallows and the Half-Blood Prince on the right pile) and a brand new black lamp - which currently has no bulb, but will be essential for night-time when it HAS got a bulb! It also looks pretty cool too. So that's it guys! A bit of an Argos furniture haul in a way!! 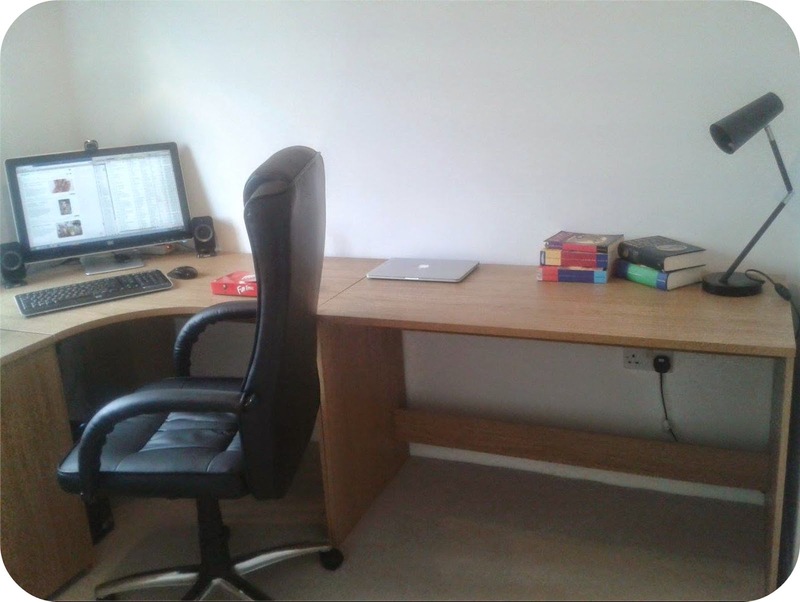 My parents really have made the Office look amazing and will be a great, spacious way to study for my upcoming 2nd year of A Levels. I will probably use it the most also as I'm the one who most uses the computer, but Sparky the cat already likes visiting a lot. Please let me know if you liked this, and maybe I can do more interior posts in the future - like the craziness of my room that pretty much reflects my personality in that respect. Do you like how our office looks? Have you recently had a part of your house renovated/would you like to? Comments are always appreciated! Love your office, so well organized, that's a good place to work! Aw thank you so much lovely, I know right - very spacious indeed! Aw haha, corner desks really do make all the difference, they actually look so cool, glad to see you're liking it - thank you for commenting!